Listed in travel books and websites as one of the “must see” destinations in Vietnam, the ancient capital of Hué is understandably an attractive spot for backpackers and tourists. Its famous Citadel and Forbidden City have become iconic images of ancient Vietnam, both set somewhat at odds against a backdrop of modernity and lightning fast development. Despite its popularity, being one part of the Hué – Danang – Hoi An trio (all equally rewarding destinations on a stretch of road just 125 kilometres long), and with the all-important Danang train station sitting in the middle, it’s a city that often fails to capture more than a handful of days in many foreigners’ itineraries. Time, of course, isn’t on anyone’s side when trying to see everything that Vietnam has to offer, but for those who want to take things at a slower pace, Hué has much more to see and do than a single day at the Forbidden City. Hué has its own international airport, Phu Bai, situated 16.5 kilometres from the citadel area, with flights to and from Saigon and Hanoi running daily. If you’ve already booked your accommodation, most hotels will happily arrange for a car to pick you up (expect to pay around 20 USD), or give you advice with regards to grabbing a cab. The closest train station on the Hanoi-Saigon line is in the city of Danang, approximately 100 kilometres from the centre of Hué. Numerous bus, minibus and taxi companies run the route, although public buses might offer the cheapest solution for those on a tight budget. For a transfer with a difference, follow in the footsteps (or tyre tracks) of the famous BBC show Top Gear and take a private motorbike tour from Danang to Hué via the famously picturesque Hai Van Pass. See Huémotorbiketour.com for details (it also offers a car transfer service). When visiting any city or town, anywhere in the world, by choosing a place to sleep among a cluster of restaurants, cafes and bars will undoubtedly thrust you into the action and provide ample choices for your dining needs. It may be a small, relatively sleepy town, but Hué is no exception. The streets around the Century Riverside Hotel form the hub of the city’s tourist zone, with several quieter, more local options to be found further out if you’d prefer. Like many aspects of life in Hué, the pace here is far more laid back than Hanoi or Saigon, with even Pham Ngu Lao Street, the city’s version of Bangkok’s notorious Khao San Road, or Saigon’s Bui Vien, feeling relatively sedate by comparison. There are, however, plenty of bars, restaurants and clubs geared up to serving the tourists, with varying themes, styles and volume levels to ensure there’s something for everyone’s tastes. Whether it’s a quiet coffee by candlelight you want, an authentic pizza, or a pitcher of beer in the lively, military-themed DMZ Bar, Hué has got you covered. Cherish Hotel at 59 Ben Nghe Street sits just a few blocks away from Pham Ngu Lao (getting a little distance from the bars is always a good bet in a country known for its thin hotel walls and windows). There are cheaper options out there, of course, but Cherish strikes a nice balance between comfort, cleanliness and cost. The breakfast buffet is large and varied, the staff friendly, and the modern rooms all quiet, spotless and well equipped. From here, with a good pair of trainers or walking shoes, guests can explore most of the major sights on foot, although the two-kilometre route to the gates of the Forbidden City may be best covered by taxi – you’ll want to save your energy for what’s inside. For more information on where to stay, click here to read our guide on hotels in Hué. Southern, Northern and Central Vietnam all get their fair share of wet weather throughout the year, however the rainy seasons region-to-region do not all come at once. Shielded by the Truong Son mountain range in the Central region, rainfall in and around Hué can be fairly mild compared to elsewhere in the country, but that isn’t to say you can leave your umbrella at home. From September, up to December or January, Central Vietnam’s rainy season gets into full swing, sometimes being augmented by the tail ends of typhoons whirling out at sea. Expect heavy rainfall and the possibility of flooding at this time of year, though, as always, it’s not guaranteed. Temperatures during the summer peak at around 34°, with a wintertime average of approximately 20°. If you plan on heading up the nearby mountains between October and March, take something warm to wear. If rain and cloud set in, you may be surprised how low the mercury can go in this otherwise sub-tropical country. Several taxi companies operate in Hué, however visitors are advised to stick only to the firms recommended by their hotels. As always, have the full address written out for the driver, and be sure to check that the meter is running correctly (it’s handy to ask your hotel for an estimate of the cost if you are unsure). Hué’s streets are much calmer than those in its bigger cities so traversing the town on foot is relatively safe, although pavements can still be uneven or even non-existent. Numerous cyclo drivers can be found parked up on Hué’s roadsides, all eagerly waiting for sweaty-faced tourists in need of a rest. They are, however, notorious for over-charging. If you really want to see the city from this unique vantage point, it’s best to organise a tour through a reputable bricks-and-mortar company, or via your hotel’s tour desk. There’s also a reason you no longer see locals taking to this old-school form of transportation. It can be extremely hot, you’re often exposed to the full impact of the sun, and, at certain times of the day, can become extremely uncomfortable as buses, cars, trucks and motorbikes pump their fumes all around you. 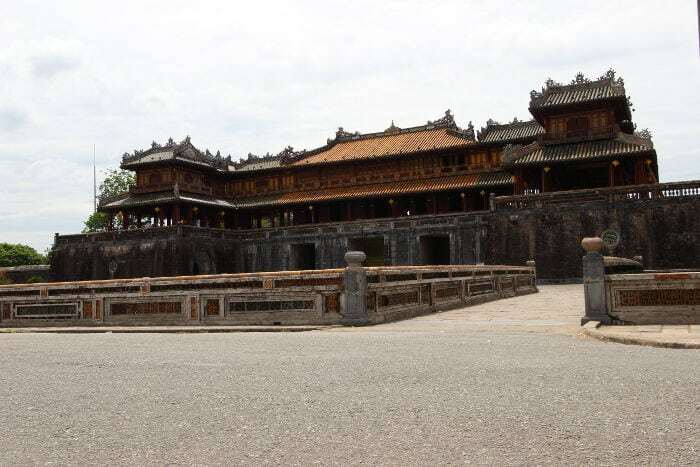 Top of everyone’s agenda when visiting Hué is its famous walled citadel and, within this, the breathtaking Forbidden City and Imperial Palace, a UNESCO World Heritage site. 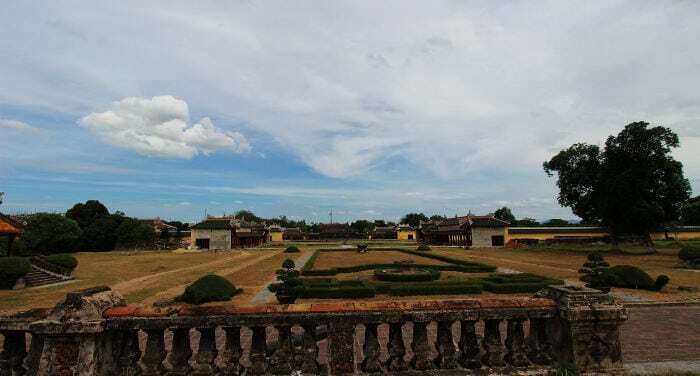 Built in the early 1800s by Emperor Gia Long, founder of the Nguyen Dynasty which would last until 1945, the walls of the citadel measure almost 10 kilometres in circumference. Tickets are purchased at the majestic (and iconic) Ngo Mon Gate (opposite the flag tower) for 150,000 VND (6.80 USD) and grant access to the various museums and historic sites dotted around the inner and outer city. Expect stunning architecture, ornate ponds, scenic temples, ancient reception rooms and Imperial-era artworks reminiscent of Vietnam’s ancient connections to China. Through various exhibits dotted throughout, glimpse into the lives of the Nguyen lords and Vietnam’s own ‘royal families’ that once occupied this ancient capital. Plan to spend four to six hours exploring the Citadel and Forbidden City. On foot is best, although there is an electric buggy service to shuttle visitors around parts of the site. Cyclo tours are also offered by unregulated drivers parked at the sides of the roads, however, prices vary wildly, as will service. Food and drink outlets can be found all over the site, however, the legendary Lac Thien restaurant, just outside the walled city, is a popular pit-stop for visitor. 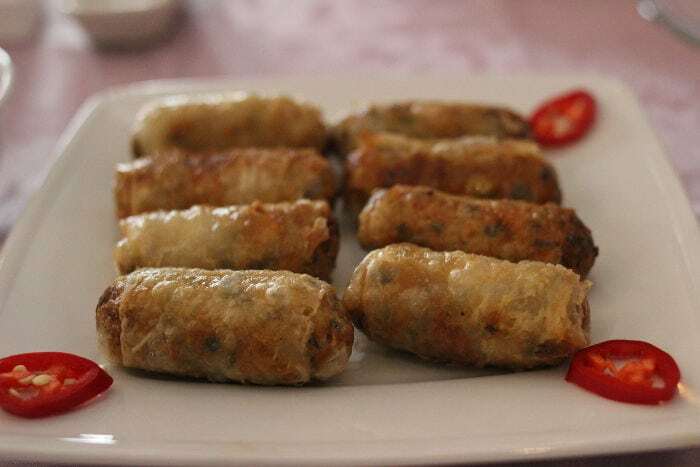 See the “Where to Eat” section below in this article..
South of Hué are the famous tombs of the Nguyen emperors, the most popular and most impressive of which are those of Emperor Tu Duc (constructed between 1864 and 1867) and Emperor Minh Mang (constructed between 1840 and 1843). Various other tombs, pagodas and historical sites dot the area, each attracting their own (often minimal) entrance fee. The tombs are best explored by organising a private car or bus tour from Hué. One of the most popular, reliable and friendly companies to use is Stop and Go Tours who also run a small cafe in the centre of Hué. Where the Mausoleums lie south of Hué, north lies the infamous (former) Demilitarised Zone, or DMZ, the buffer zone running five kilometres along either side of what was the border between North and South Vietnam. The region was witness to some of the bloodiest battles of the Vietnam War and is best explored through a one-day private tour. Again, Stop and Go are one of the best companies for this, providing comfortable private cars with English-speaking guides who lived in the area throughout the war. As you journey between famous sites historic such as Hamburger Hill, the former Khe Sanh combat base, the Vinh Moc Tunnels (an incredible underground network far deeper and more elaborate than Saigon’s Cu Chi Tunnels), and the poignant Hien Luong Bridge, hear first-hand the stories of war, and witness the indelible scars it left on this area and the people who inhabit it. The wide and meandering Perfume River cuts right through the centre of Hué and offers a scenic alternative route to access many of the nearby temples and mausoleums. Full and half-day tours, plus shorter pleasure boat rides, can often be arranged with reputable companies via your hotel, or through popular tourist cafes such as Mandarin which runs its own in-house tour desk. One of the most trusted motorbike companies in the area, Hué Adventures offers one-day tours of Hué and the surrounding countryside. Ride on the back of a comfortable motorcycle, with a friendly and experienced driver, as you explore the area like a local. For those travelling on to the region’s second historic town, the Hué to Hoi An tour will take you up and over the spectacular Hai Van Pass and along some of the most scenic and memorable roads Vietnam has to offer. Longer tours to Phong Nha and Nha Trang are also available and offer a once-in-a-lifetime chance to see into the heart of Vietnam – something that cannot be glimpsed from the windows of a bus on the highway. The Imperial cuisine of Hué is famous all over Vietnam. As the chefs of the Nguyen lords sought to create ever more elaborate and inventive dishes to please the emperors, so came a menu renowned for its unique flavours and culinary excellence. Most famous among Hué’s dishes are bun bo Hué (or, simply ‘bun bo’), a richer, more decadent version of beef pho (note: it also contains pork), and banh khoai, delicately flavoured rice crepes typically filled with pork and shrimp. To really immerse yourself in the local delicacies, a street food tour is a perfect way to uncover the secret spots you might otherwise miss as a tourist. Companies like Hué Flavour come with glowing reviews and in many ways provide more than a simple adventure in flavour. With local guides at your side, a food tour becomes as much about the stories as it does the dishes. If you fancy learning to cook like a local, the friendly folk at Hué Cooking Class will pick you up from your hotel and give you a tour of the local markets as you collect the very freshest ingredients, before taking you to their school for a private or group cookery lesson. Not to be confused with the neighbouring establishment with a spuriously similar name, Lac Thien has been a magnet for hungry tourists for decades, and for good reason. The menu is varied and easy to understand, filled with local delicacies such as bun bo Hué, and banh khoai. The owner, Mr Lac, is a truly lovely character, and may even leave you with a parting gift. Lac Thien’s location, just outside the southeast gate of the citadel, makes it a perfect lunch or dinner spot for before, during or after a day of exploring. With two locations on this short but scenic pedestrianised strip on the banks of the river, slotted among souvenir, art and ice cream shops, Ancient Town has both the flavours and the atmosphere to sit as one of the most recommended restaurants in the city. Local dishes are, of course, the speciality, with seafood being the focus, yet flavours collected from all over Vietnam can be found here. Always popular, it’s worth booking ahead or arriving early to guarantee a prime spot. For a belly-busting burrito or a zingy plate of tacos, this cosy diner on backpacker street offers an authentic and affordable alternative to the local fare. Staff are super hospitable and accommodating and service is fast and attentive. Frequently dubbed the best Indian restaurant in Saigon, Ganesh now boasts restaurants along the entire length of Vietnam, including one in Hué, and the quality has clearly travelled well. Authentic flavours, a long and varied menu and always great service. Hué’s most famous pizzeria is well worth a visit if you’re craving European cuisine. With a beautiful interior, a warm welcome and reasonable prices, it’s obvious why Little Italy is so popular. If the rain has set in, or you’re just too tired to leave your hotel, give them a call for delivery right to your door. Visitors to Hué needn’t rush straight off to Danang or Hoi An at the end of their stay. After improvements to local transport links and roads, the countryside outside of Hué is now home to several luxury hotels and resorts. One of the most decadent, yet surprisingly affordable, sits on the banks of one of the largest inland lagoons in Southeast Asia, 40 kilometres from the city centre. Do your homework, check the booking sites, and you may be able to bag the biggest hotel room of your life for somewhere in the region of 150 USD a night. The five-star Vedana Lagoon Resort & Spa is an ideal respite after (or before) the sight-seeing whirlwind that a trip to Hué can become. Access couldn’t be easier: a free shuttle bus runs daily between the resort and the citadel, and private transfer to Hué airport can also be organised for 680,000 VND for up to four persons. Hugging the steep hillside between the highway and the water, Vedana’s secluded villas and bungalows almost disappear into the carpet of tropical vegetation. The spacious hilltop villas offer spectacular views of the lagoon and surrounding mountaintops, while the water-side bungalows (perched on stilts in the shallows) bring the sights and sounds of the lagoon right to your four-poster bed. Many properties feature private pools and sun decks, although there’s also a beautiful pool for all guests to enjoy beside the restaurant. Free bicycles are also available for hopping from the spa and water-front yoga deck, to the restaurant, the pool, then back to the serene seclusion of your villa or bungalow. If you’re feeling lazy, however, free golf cart shuttles can be summoned at a moment’s notice. If you can break free of the lure of the poolside, day trips to nearby sights and attractions are offered via the resort’s private limousine service. Located five minutes from the gates of the Vedana compound sits the entrance to one of Vietnam’s most spectacular national parks. Bach Ma is vast, and best accessed with a private car tour provided by the resort. Dotted along the long and steep road to the park’s highest peak (some 1,450 metres above sea level) are several short hikes into the wilderness to sea waterfalls, lakes and, if you’re lucky, gibbons. The park also hides the remains of several former French-era hill station settlements, along with notable points of interest from the Vietnam War and numerous species of plant and wildlife. As Vietnam continues to develop its tourist sector, cities and towns like Hué, that once offered little more than one or two points of interest to otherwise transient guests, are developing into hubs of activity with more to offer foreign guests than ever before. A boom in the country’s budget airline industry has sent flight prices tumbling, making Hué a quick, convenient and affordable destination for all. Simon Stanley is a freelance writer based in Ho Chi Minh City, Vietnam. Visit his website at www.simonstanleywriter.com. Thank you for your article. I’m going to vietnam in april and want to go straight from Hoi An to Hue. Is there any shuttle bus connecting two these destination? I read in the article journeyonair.com/hue-vietnam/, they say that ca Hue is a specialty of vietnam. Have you experienced it? Can you tell me where to experience it? Hello Cindy, yes there are buses that connect Hanoi to Hué, I took it muyself in 2012. Are you looking for a Tour in Asia? Do you need a Train, Bus or Plane Ticket for Vietnam? Need help for organizing your trip to Vietnam?